I never knew this. There's chokecherries and chokeberries. They look pretty much the same, grow pretty much the same, but their taste is substantially different. Chokecherries are usually sweet. Chokeberries are the ones that give you a "fuzzy" mouth. I thought it had something to do with where they were growing, like the soil pH or the amount of available water. 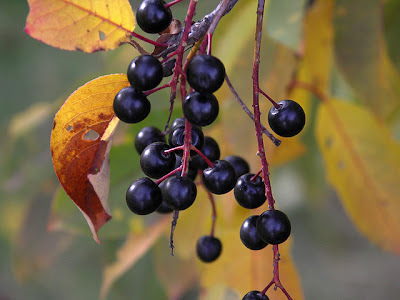 Prunus virginiana (chokecherry) is a species of suckering shrub or tree native to North America that grows to about 5 m tall. It is found almost throughout the continent except for the Deep South, Labrador and the far north. The fruit are about 1 cm across and range in color from bright red to black, with a very astringent, sour taste. The very ripe berries are dark in color and less astringent than the red berries. Let soak in sugar and vodka for 1 month. Chokecherry leaves and branches are toxic to horses, and moose, cattle, goats, deer, and other ruminants (animals with segmented stomachs). Cyanide is released into the leaves when they wilt, such as after a frost or branches have been broken. Cyanide makes these parts sweet. 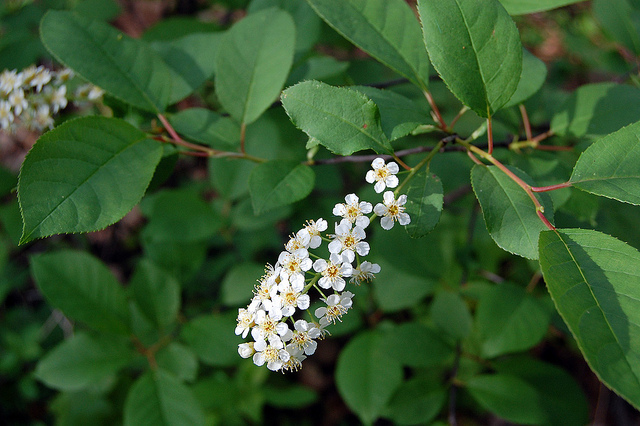 Chokecherry is a favourite fruit to make homemade wine in wide parts of Canada and the United States. Juice from chokeberries is astringent (pucker inducing) and not sweet, but high in vitamin C and antioxidants. The berries can be used to make wine, jam, syrup, juice, soft spreads, and tea. In The U.S. chokeberries are added to juice blends for their color and antioxidant properties. The red chokeberry is more palatable and can be eaten raw. It has a sweeter flavor than the black species and is used to make jam. Press out as much vodka/juice from the berries as you can. Chokecherries and chokeberries are very high in antioxidant pigment compounds, such as anthocyanin. 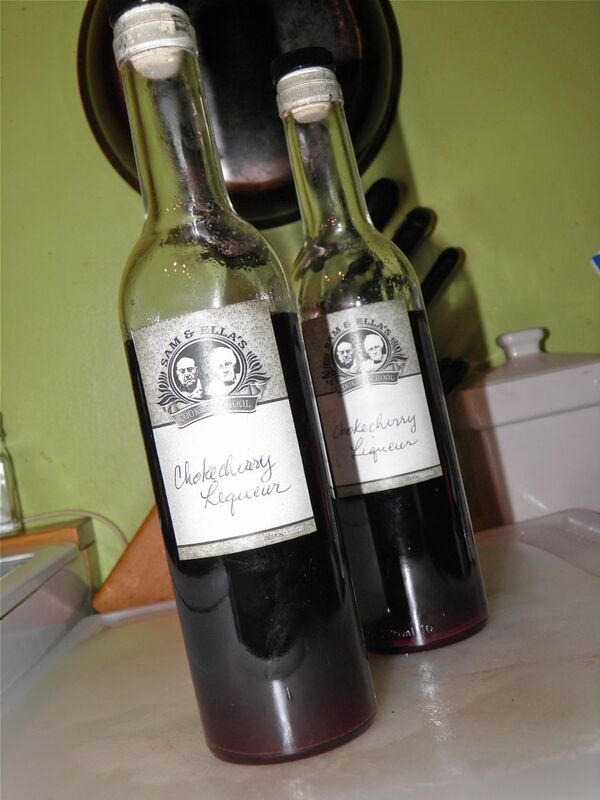 I hadn’t a clue about all this when I went picking choke”cherries” for liqueur. So this is decidedly a blend. You will note from the recipe that there’s an inordinate amount of sugar used. I would suggest I had more berries than cherries. One thing I do have to say is that you can taste no alcohol at all in my finished product. At first I though I had forgotten it, but I never would have let it age on the conter for a month without it. Without any discernible alcohol taste...c’est dangereux ! Wash a 1 L Mason jar and lid. are available for free download here. Pick through the berries for stems and rinse. Discard any that are damaged or otherwise undesirable. Add the berries and 1-1/2 cups sugar to the Mason jar. Pour the vodka in over the berries. Seal tightly and shake well. Let stand for 1 month in a shady place, shaking the jar on a daily basis. 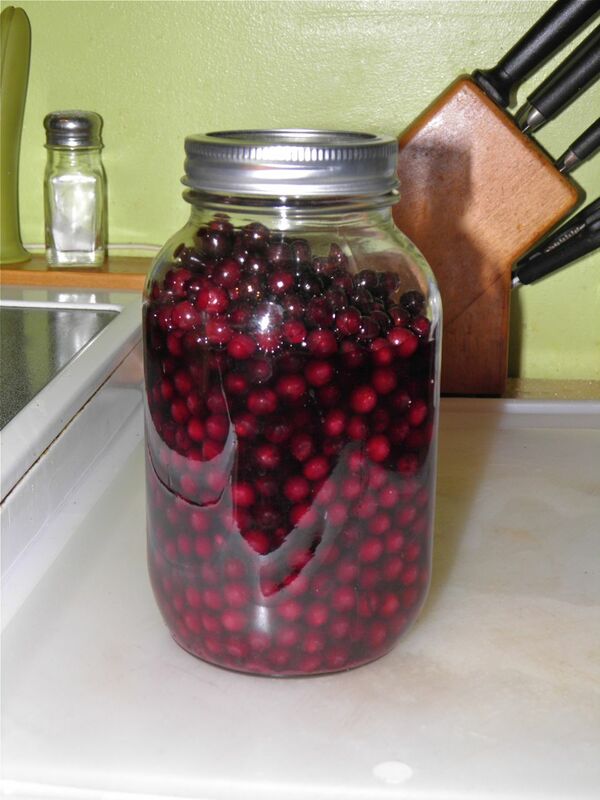 Over the month you will notice the berries become engorged with the alcohol. A the end of the month, bring the berries just to a boil in a saucepan. mash them while this is happening. You’re trying to break up the berries as much as possible to extract the maximum juice without damaging the pits (which are toxic). Strain a few times until fairly clear. Bring the remaining sugar and water to a boil and let boil hard for 5 minutes. Combine with the infused vodka and bottle. * If using all chokecherries you will want to reduce this sugar. Taste your fruit. If they’re sour add it. If not, cut back the amount. Oooh thank u for your recipe I am going to try this on the weekend. I have so many chokecherrys that I don't know what to do and this sounds amazing. So by shake the jars everyday for a whole month? Did I read that correctly. And let's say I were to forget to shake the jars for a few days. Would anything bad happen? * so do you shake the jars everyday. Is what I meant to write. You can go a few days between shaking. It's a good idea to keep the sugar dissolved and the cherries moving around in the sugar/liquor to encourage the exchange of juice with liquor. Really all you have to do is turn it end for end a couple times every few days. But it's easy enough if you're home to give it a turn. Question. You said "bring the berries just to a boil in a saucepan". Do you scoop the berries out of the alcohol, or put the liquid in as well? and if so, doesn't the alcohol evaporate? Hi. After steeping for a month you bring the mixture just to a boil. 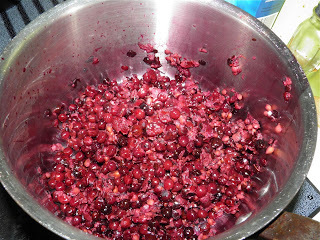 No need to boil it any more than a minute or two, to break up the berries. Then strain a few times through cheesecloth or a jelly bag or old piece of clean pillowcase – to get rid of the pulp, and pits.